URBACTs projects from the first and second calls have produced a variety of outputs such as case studies, recommendations and tool boxes. In addition, a process of capitalisation was launched in order to reflect on the lessons learnt and ensure that other cities can benefit from these experiences and adapt to their own context the solutions to urban challenges developed within the programme. Capacity-building for Local Support Groups (ULSGs). 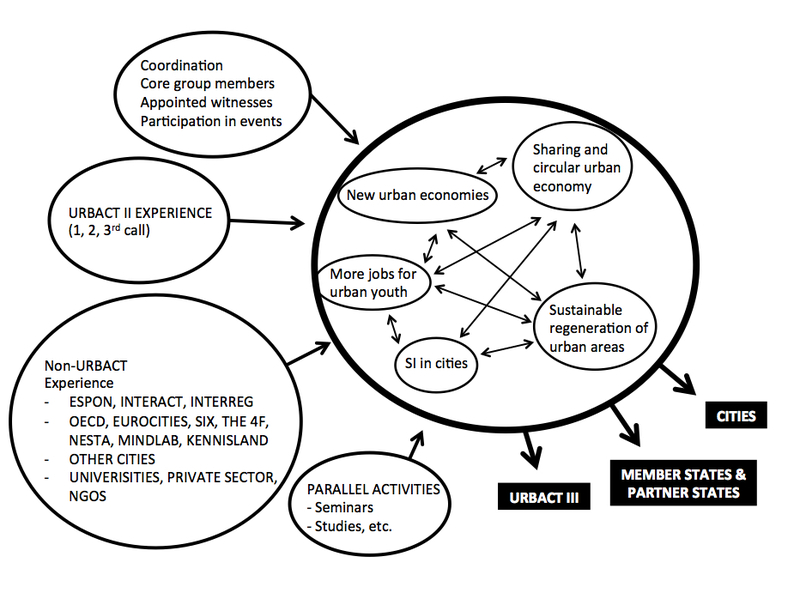 The results of the first Capitalisation process have been processed in the annual magazine “URBACT Tribune” and in the series of URBACT thematic reports “Cities of Tomorrow: Action Today”. To bridge the current thematic coverage of the programme with the thematic priorities that will drive the implementation of URBACT III. Also, it was particularly stressed that the outcomes of this process will benefit the 15 new thematic networks under 3rd call. The methodology used shall be similar to that of the first capitalisation process, together with the participation in several external events such as Open Days workshops in October 2014 and other dissemination events to which the 5 workstreams will be invited to contribute. Overall, the process of this capitalisation process is summarised in the figure below.